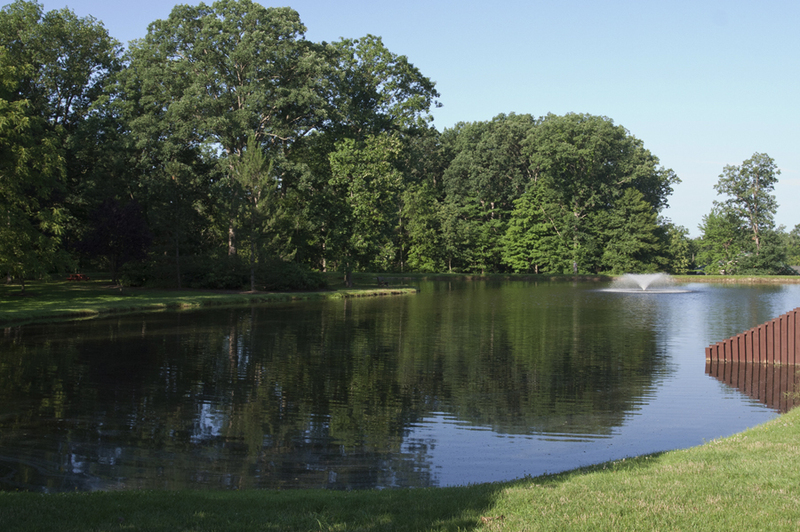 Marshall Lake, located behind the Clubhouse, is named after the family which built the scenic, 2 acre, man-made lake. The lake is 7’ deep at its deepest point and is regularly maintained to keep it free of algae. GVCA stocks the lake with a variety of fish including rainbow trout, large mouth bass, bluegill, crappie, channel catfish and amurs. Broadhead minnows and shiners are stocked as a food source for the other fish. Fishing is allowed for residents and their guests. Trout, Blue Gill, and Crappie are catch and eat, All Other Fish are Catch and Release. (please do not use triple hooks, they injure the fish too much.) Click here to see the complete Marshall Lake Rules. Benches and picnic tables, scattered along the lake and in the beautifully landscaped grounds adjacent to the lake, offer residents an area to enjoy a scenic picnic or a relaxing stroll along the lake. Playground equipment and the tennis courts are nearby. The Warren Bruns Trout Derby, named in honor of GVCA’s longest serving president and strong supporter of the event, is held every spring the first Saturday in May. 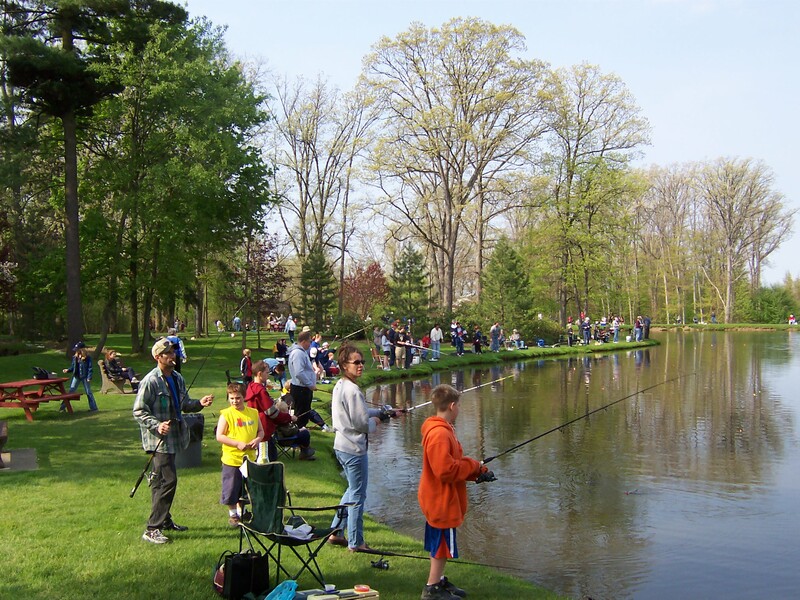 Just before the event the lake is stocked with rainbow trout, large mouth bass, sunfish, bluegill, channel catfish, and amurs. Contestants are divided into age groups and prizes are awarded for the largest catches in each category. Residents get to keep the rainbow trout they catch. Hot dogs and soda pop are served during the event. The Trout Derby is followed by a Cinco de Mayo party with a full Mexican buffet, drinks and a pinata contest. Our many thanks go out to the GVCA staff, the resident volunteers,and all the participants who made it a great event. A special thank you goes to Beth Paddock and her company, PS Awards, who donated the great medals for the Derby winners every year. 2017 Trout Derby Results The GVCA Trout Derby was held on Saturday, May 6, 2017. Go to the June 2017 newsletter to see all the results. 2016 Trout Derby Results The GVCA Trout Derby was held on Saturday, May 7, 2016. This year we had 6 golden trout winners! Go to the June 2016 newsletter to see all the results. 2015 Trout Derby Results The GVCA Trout Derby was held on Saturday, May 2, 2015. Go to the June 2015 newsletter to see all the results. 2014 Trout Derby Results The GVCA Trout Derby, held on Saturday, May 3, 2014, was a huge success. We had over 180 fishermen and the fish were really biting. The largest trout was 14 ¼ inches. The largest other fish turned out to be a whopping 29 inch channel catfish. It required two determined young men working together to pull it out of the lake! Go to the June 2014 newsletter to see all the details. We hope everyone had a great time and we look forward to seeing you next year.